Note: The state-by-state gun laws infographic in this article was updated April 18, 2019. Overall, gun deaths in the United States have dropped by 30% since 1993, but mass shootings are on the rise: there have been more mass shooting deaths in the past 11 years than in the previous 23. 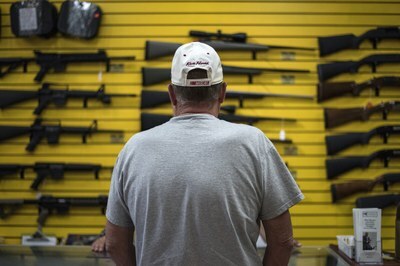 No matter which way you look at it, though, more Americans are buying guns than ever before. Federal background checks (which do not equate directly to gun sales) leapt from just over 9 million in 1999 to 19.8 million so far in 2015. These checks are meant to prevent people from buying firearms who have a criminal record, have been convicted of domestic abuse, are addicted to drugs or have documented mental health problems that have led to confrontations with law enforcement or to involuntary confinement. But in many Western states, private sales, such as those at gun shows or over the internet, are excluded from background checks. A customer at ABQ Guns in Albuquerque. Gun laws in New Mexico, along with Montana, Wyoming and Alaska, have received a “failing” grade from the Law Center to Prevent Gun Violence. Western states have some of the highest and lowest gun-ownership rates in the nation, and gun laws vary widely from state to state. Some states aren’t set up to report domestic crimes to the federal background check database, for example, despite the fact that many mass shooters — including Robert L. Dear Jr. — have a history of domestic abuse. On Friday, November 27, 2015, a man identified by officials as Robert L. Dear Jr. walked into a Planned Parenthood clinic in Colorado Springs carrying a semiautomatic rifle. When police rushed to the scene, he opened fire, killing three people and wounding nine. Just five days later, on December 2, another mass shooting happened in the Western U.S. The details are still murky, but as of Thursday afternoon, 14 people were reported killed and 21 wounded at a center for people with disabilities in San Bernardino, California. A federal law enforcement source told the Los Angeles Times that — like most weapons used in mass shootings— the assault rifles and semi-automatic handguns used in the attack were acquired legally.